So, what does the Postgres Operator actually deploy when you create a cluster? On this diagram, objects with dashed lines are components that are optionally deployed as part of a PostgreSQL Cluster by the operator. Objects with solid lines are the fundamental and required components. For example, within the Primary Deployment, the metrics container is completely optional. That component can be deployed using either the operator configuration or command line arguments if you want to cause metrics to be collected from the Postgres container. 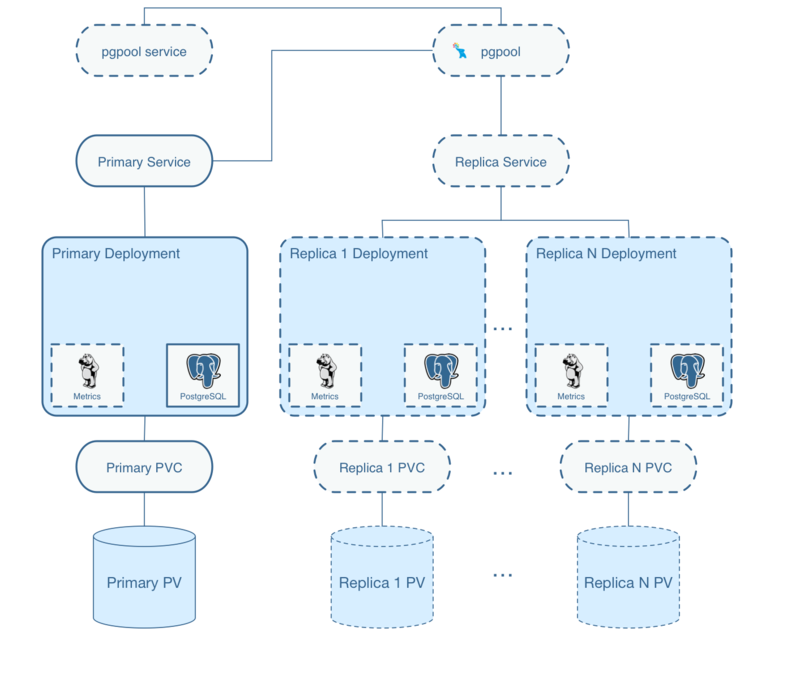 Replica deployments are similar to the primary deployment but are optional. A replica is not required to be created unless the capability for one is necessary. As you scale up the Postgres cluster, the standard set of components gets deployed and replication to the primary is started. Notice that each cluster deployment gets its own unique Persistent Volumes. Each volume can use different storage configurations which provides fined grained placement of the database data files. Metadata about the Postgres cluster deployments are stored within these CRD resources which act as the source of truth for the Operator. Kubernetes events are created for the Operator’s CRD resources when new resources are made, deleted, or updated. These events are processed by the Operator to perform asynchronous actions. As events are captured, controller logic is executed within the Operator to perform the bulk of operator logic. A feature of the Operator is to provide a REST API upon which users or custom applications can inspect and cause actions within the Operator such as provisioning resources or viewing status of resources. This API is secured by a RBAC (role based access control) security model whereby each API call has a permission assigned to it. API roles are defined to provide granular authorization to Operator services. One of the unique features of the Operator is the pgo command line interface (CLI). This tool is used by a normal end-user to create databases or clusters, or make changes to existing databases. The CLI interacts with the REST API deployed within the postgres-operator deployment. You can have the Operator add a node affinity section to a new Cluster Deployment if you want to cause Kubernetes to attempt to schedule a primary cluster to a specific Kubernetes node. The affinity rule inserted in the Deployment use a preferred strategy so that if the node were down or not available, Kubernetes will go ahead and schedule the Pod on another node. Manual and automated fail-over are supported in the Operator within a single Kubernetes cluster. Manual failover is performed by API actions involving a query and then a target being specified to pick the fail-over replica target. Automatic fail-over is performed by the Operator by evaluating the readiness of a primary. Automated fail-over can be globally specified for all clusters or specific clusters. Users can configure the Operator to replace a failed primary with a new replica if they want that behavior. The Operator integrates various features of the pgbackrest backup and restore project. A key component added to the Operator is the pgo-backrest-repo container, this container acts as a pgBackRest remote repository for the Postgres cluster to use for storing archive files and backups. 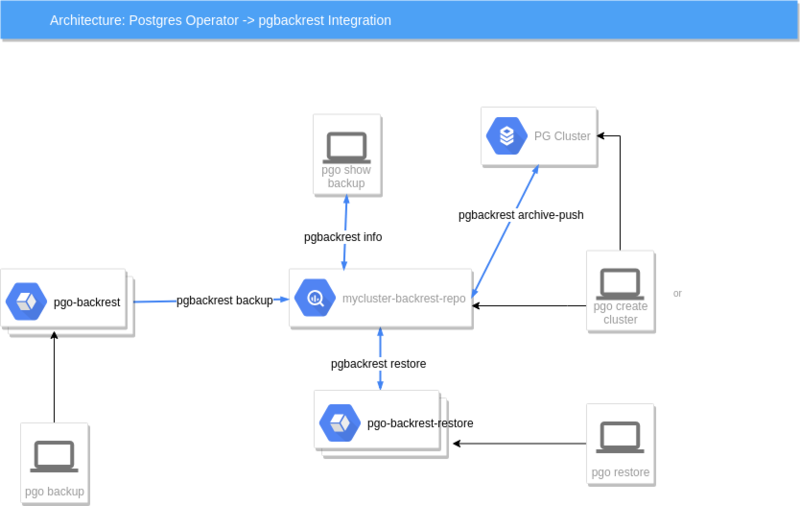 a user when they enter pgo backup mycluster –backup-type=pgbackrest will cause a pgo-backrest container to be run as a Job, that container will execute a pgbackrest backup command in the pgBackRest repository container to perform the backup function. The pgbackrest restore command is implemented as the pgo restore command. This command is destructive in the sense that it is meant to restore a PG cluster meaning it will revert the PG cluster to a restore point that is kept in the pgbackrest repository. The prior primary data is not deleted but left in a PVC to be manually cleaned up by a DBA. The restored PG cluster will work against a new PVC created from the restore workflow. At this point the PG database is back in a working state. DBAs are still responsible to re-enable autofail using pgo update cluster and also perform a pgBackRest backup after the new primary is ready. This version of the Operator also does not handle any errors in the PG replicas after a restore, that is left for the DBA to handle. after a restore, exec into the PG primary and make sure the database has fully recovered by looking at the database logs, if not recovered, you might have to run psql command select pg_wal_replay_resume() to complete the recovery, on PG 9.6⁄9.5 systems, the command you will use is select pg_xlog_replay_resume(). a pgBackRest restore is destructive in the sense that it deletes the existing primary deployment for the cluster prior to creating a new deployment containing the restored primary database. However, in the event that the pgBackRest restore job fails, the pgo restore command be can be run again, and instead of first deleting the primary deployment (since one no longer exists), a new primary will simply be created according to any options specified. Additionally, even though the original primary deployment will be deleted, the original primary PVC will remain. there is currently no Operator validation of user entered pgBackRest command options, you will need to make sure to enter these correctly, if not the pgBackRest restore command can fail. the restore workflow does not perform a backup after the restore nor does it verify that any replicas are in a working status after the restore, it is possible you might have to take actions on the replica to get them back to replicating with the new restored primary. when performing a pgBackRest restore, the node-label flag can be utilized to target a specific node for both the pgBackRest restore job and the new (i.e. restored) primary deployment that is then created for the cluster. If a node label is not specified, the restore job will not target any specific node, and the restored primary deployment will inherit any node label’s defined for the original primary deployment. The Operator includes a cronlike scheduler application called pgo-scheduler. Its purpose is to run automated tasks such as PostgreSQL backups or SQL policies against PostgreSQL clusters created by the Operator. Schedules are removed automatically when the configmaps are deleted. PGO Scheduler uses the UTC timezone for all schedules. Day of month | Yes        | 1-31            | * / , - ? Day of week  | Yes        | 0-6 or SUN-SAT  | * / , - ? pgBackRest schedules require pgBackRest enabled on the cluster to backup. The scheduler will not do this on its own. Policy schedules require a SQL policy already created using the Operator. Additionally users can supply both the database in which the policy should run and a secret that contains the username and password of the PostgreSQL role that will run the SQL. If no user is specified the scheduler will default to the replication user provided during cluster creation. The Operator makes use of custom resource definitions to maintain state and resource definitions as offered by the Operator. When using the Operator in a Kubernetes cluster consisting of nodes that span multiple zones, special consideration must be taken to ensure all pods and the volumes they require are scheduled and provisioned within the same zone. Specifically, being that a pod is unable mount a volume that is located in another zone, any volumes that are dynamically provisioned must be provisioned in a topology-aware manner according to the specific scheduling requirements for the pod. 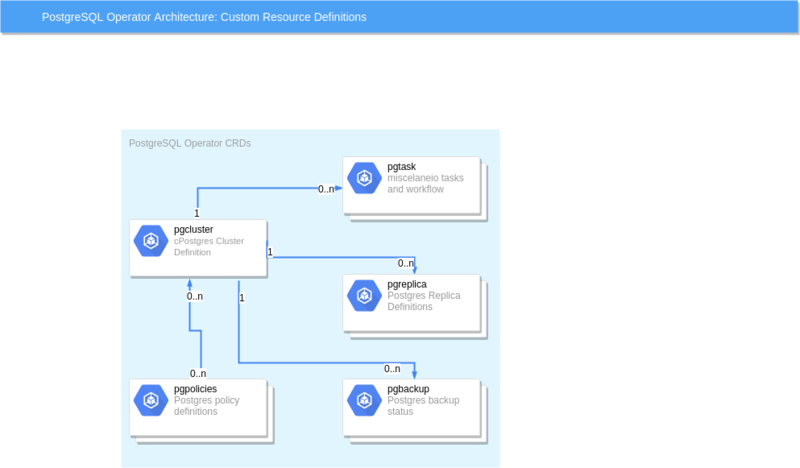 For instance, this means ensuring that the volume containing the database files for the primary DB in a new PG cluster is provisioned in the same zone as the node containing the PG primary pod that will be using it. Unfortunately, using Immediate for the volumeBindingMode in a multi-zone cluster can result in undesired behavior when using the Operator, being that the scheduler will ignore any requested (but not mandatory) scheduling requirements if necessary to ensure the pod can be scheduled. Specifically, the scheduler will ultimately schedule the pod on a node in the same zone as the volume, even if another node was requested for scheduling that pod. For instance, a node label might be specified using the --node-label option when creating a cluster using the pgo create cluster command in order target a specific node (or nodes) for the deployment of that cluster. Within the Operator, a node label is implemented as a preferredDuringSchedulingIgnoredDuringExecution node affinity rule, which is an affinity rule that Kubernetes will attempt to adhere to when scheduling any pods for the cluster, but will not guarantee (more information on node affinity rules can be found here). Therefore, if the volume ends up in a zone other than the zone containing the node (or nodes) defined by the node label, the node label will be ignored, and the pod will be scheduled according to the zone containing the volume. With this approach, the pod will once again be scheduled according to the zone in which the volume was provisioned. However, the zone parameters defined on the Storage Class bring consistency to scheduling by guaranteeing that the volume, and therefore also the pod using that volume, are scheduled in a specific zone as defined by the user, bringing consistency and predictability to volume provisioning and pod scheduling in multi-zone clusters. For more information regarding the specific parameters available for the Storage Classes being utilizing in your cloud environment, please see the Kubernetes documentation for Storage Classes. Lastly, while the above applies to the dynamic provisioning of volumes, it should be noted that volumes can also be manually provisioned in desired zones in order to achieve the desired topology requirements for any pods and their volumes.